There are two series on offer: option I (for five years) and option II (for three years). So far, Religare Finvest has offered the highest rate of interest to individual investors—12.5% in option I and 12.25% in option II. 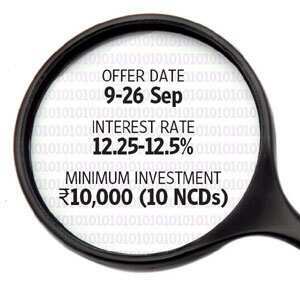 Each NCD is worth ₹ 1,000. Allotment will be done on first-come-first-served basis. Interest payments will be made on 1 April each year, the first coming up on 1 April 2012. The last interest payment will be made at the time of redemption on a pro-rata basis. The debenture issue has been rated CARE AA- by CARE and [Icra] AA-(Stable) by Icra. “AA" rating suggests that a company has high ability for servicing financial obligations and low credit risk, but the modifier “-" suggests that within its category the company’s comparative standing is below average. Religare Finvest, a wholly owned subsidiary of Religare Enterprises Ltd, is an NBFC that doesn’t accept deposits and has its main focus on financing small and medium enterprises (SMEs) and retail capital market financing. Nearly 70% of its business comprises SME financing and 15% comes from the capital market segment. Moreover, about 90% of their advances and loans are secured either by property or, in case of capital market, by shares. Loans against property and commercial assets comprise 53% of their total loan book as on 30 June 2011. As per the management, the loan against property book was roughly at 50% of the original property value. The company, albeit with a longer group history, is fairly new. It has its reach in 15 states with 39 branches. While the above statistics bode well for the company, one shouldn’t overlook the fact that it is relatively a new entrant. Moreover, its fast pace of growth has meant that the capital adequacy ratio has declined at a fast rate from 64.27% in 2009 to 16.16% in 2011. While this is still within the Reserve Bank of India guidelines, they may not have too much legroom. For further growth, more capital will have to be raised. Its debt-to-equity multiple, as on 31 March 2011, was 5.6, which is on the higher side and is likely to get bumped up post the current issue. Moreover, the maximum exposure to the company’s loan book comes from the SME segment, which intrinsically makes it a risky business, although so far the company has maintained very low non-performing assets. However, the parentage of the company, which is a well-established financial services company with a pan-India presence, lends credibility to the issue. Moreover, as per industry sources, there are no more draft offer documents for NCDs in the pipeline, which suggests that this could be the last public issue of NCD for some time to come. At a rate of 12.5%, it is attractively priced given the risk. Invest only to hold till maturity.